"Momoko! Why are you wearing that wedding dress?!" "Momoko! Why are you wearing that wedding dress?!" The above info came from KJ91, and was edited by yours truly (contact me). The image came from Atari. Hinagiku is Momoko and Yuri's best friend. She has a very unique hair color. She is the third Ai Tenshi to be awakened by Limone and Aphrodite, Angel Daisy. 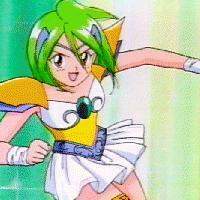 As Angel Daisy she uses her Saint Pendule (a cute little wrist watch) to blast the enemy and to transform. She also possesses the Saint Something Borrowed, her friend Sari's pendant. Hinagiku thinks that Momoko is a little silly and childish at times... but in truth she's just as bad! Momoko, Yuri, and Hinagiku all have a crush on Yunagiba, the captain of the soccer team, and because of this they sometimes get in little arguments about who'll interview him for the school paper.